Your curling iron should do the work for you, so why are you still using a manual curling tool? The best automatic curling iron features a rotating barrel or chamber to make fast work of styling your hair. 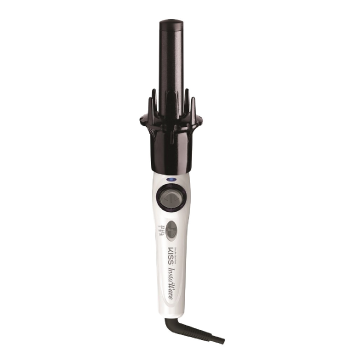 Some tools offer multiple heat settings and work with a wide range of hair types and lengths. It’s becoming easier than ever to create natural-looking curls in straight hair with the array of styling tools on the market. Automatic curling irons have become incredibly popular in the past couple of years, offering women a simple way to get beautiful curls with the least amount of fuss possible. Our guide to the best automatic curling irons or best rotating curling irons features eight of our favorite picks for spinning curling irons that can meet the needs of most hair types. These irons can give you a virtually hands-free curling process that makes it look like you just stepped out of the salon. The big thing that sets automatic curling irons apart from standard curling irons is that they rotate, so that you don’t have to manipulate hair around the barrel yourself. Heat settings. Only one of the curling irons, the VAV curling wand, offered just a single heat setting. The rest had at least two. Our top pick, from BaByliss, had the most options and a top heat of 450 degrees. Barrel material. Most of the curling irons we reviewed, including the one from Kiss Products, the Conair model, the VAV and the Beachwaver had tourmaline or ceramic barrels, which helps reduce frizz. Chamber vs. Barrel. 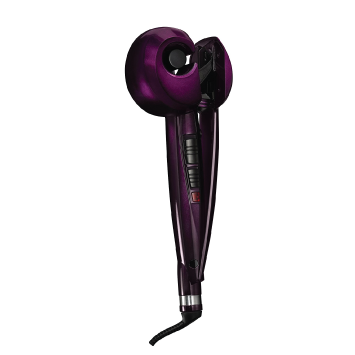 Two of our picks, the BaByliss and the Conair, feed hair into a chamber to curl it. The rest have a rotating barrel. Chamber models can be a bit trickier to use. Additional features. Our top pick, the BaByliss, lets you use steam to set and hold your curls. We’ve chosen the top eight automatic curling irons that rotate on their own to give you several options, allowing you to find the best iron for your hair type and desired look. Let’s get started with one of the pricier models, the BaBylissPro Nano Titanium Miracurl Steamtech Professional Curl Machine. Whew, that’s a mouthful! What sets the BaByliss apart from other automatic curling irons is that it uses steam to help set your hair. The steam feature claims to create curls that hold for up to 24-hours and that are 20 percent more defined than curls made without steam. The BaByliss model doesn’t have a rotating barrel to create curls. Instead, small sections of hair get fed into a chamber. You use the tool by placing the hair between the two sides of the curling iron chamber, starting at where you’d like the curl to begin. The tool heats up to 450 degrees Fahrenheit and has several heat settings so that it can create a variety of different curls and works on a range of different hair types. It will also count how long you’ve curled your hair for and will beep after 4, 8, 10, and 12-second intervals. People who have used the BaByliss have mostly been happy with it, although some have said that the curling iron did burn their hair. Others have called it the best curling iron they’ve ever used. Uses steam to help set the curls. Multiple heat settings and a maximum temperature of 450. Sounds an alarm to let you know how much time has passed. It is on the pricier side (over $100). Some have complained that the tool pulls their hair. The xtava Auto Styler may be one of the most user-friendly of its type on the market. With a digital display that clearly tells you the temperature you’re on, you have ultimate control over your style and heat protection with this curler. This curler works a bit different than the other rotating models on our list. It looks like a typical curling iron with a clamp, but the barrel spins in a 360-degree motion to wrap your hair on its own, giving your hands and wrists a break over a traditional curling iron. 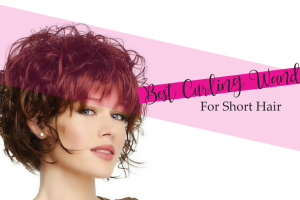 This can be helpful for people who want a more hands-free approach to curling but may not be able to use automatic curlers because their hair is prone to easy snagging in the teeth. Many customers who love this curling iron say that they can get long-lasting curls much quicker than they can with a traditional iron and they like that it doesn’t put as much wear and tear on their wrists. 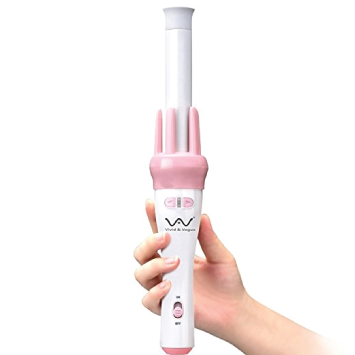 The KISS Ceramic Instawave is a budget-friendly option that may be best for people just learning how to use a rotating curling iron and don’t want to pay a lot of money until they figure out how one works on their hair. This curling iron has a tangle-free design that can work with several hair types, including thick, coarse hair. It does fall a little short on very fine hair, though, which can be difficult to grab with the spinner. We like that this curler offers a low and high heat setting so that it can prevent damage to thinner hair while giving thick hair the ability to hold a curl. The ceramic barrel offers even heat distribution for more efficient curling and helps hair glide off easily. One of the features that customers love most about this auto curling iron is that it’s gentle on their hair with its detangling design, yet it styles their hair quicker than most traditional curling irons. Another budget-friendly automatic curling wand is this model by VAV, which has a 1-inch barrel that can create curls in most hair lengths. One notable feature of this curling wand is its barrel design. The internal barrel offers quick-heating and even heat distribution for long-lasting curls, and the outer portion of the barrel is made of tourmaline ceramic to help hair glide, protect hair from heat, and prevent frizz. This curler may take a little time to get the hang of because it doesn’t offer a very comfortable or natural grip. However, once you get some practice with it, you should be able to curl your whole head of hair in a fraction of the time it would take you to do so with a regular curler. 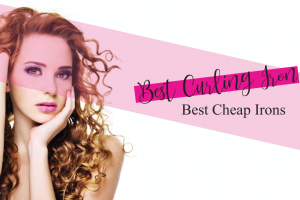 Most customers who’ve given this curler a positive review agree that, after some practice, they were able to create long-lasting curls that look bouncy and natural, especially because you can curl your hair in either direction for a more natural style. 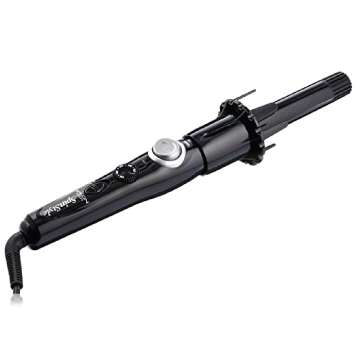 The Infiniti Pro by Conair is a chamber style automatic curling iron. Unlike the BaByliss, it doesn’t use steam to curl the hair, just heat. The inside of the chamber is coated with tourmaline ceramic to help minimize frizz and improve shine. Also, the handle of the Infiniti Pro is ergonomically designed so that you can get a comfortable grip even when you have a lot of hair to curl. 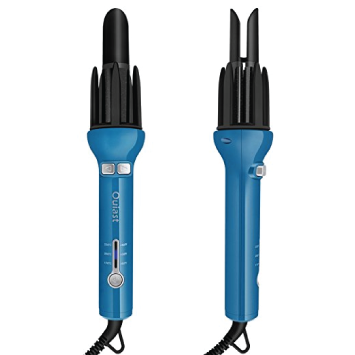 Like a few of the other models in our roundup, the Conair automatic curling iron has two heat settings. It heats up to 400 degrees at the highest setting. To help you get the right shape of curl, the curling iron has three timer settings. It also has a safety feature to minimize damage and prevent tangles. Some users of the Conair curling iron have called it virtually foolproof, noting that it helped to curl their hair better than anything else. Others have called it a lazy person’s best friend. Not everyone is happy with the curling iron, though. Some found that their hair got stuck in the chamber and that the automatic hair curler was tricky to use. Two heat settings, a max heat of 400 degrees. 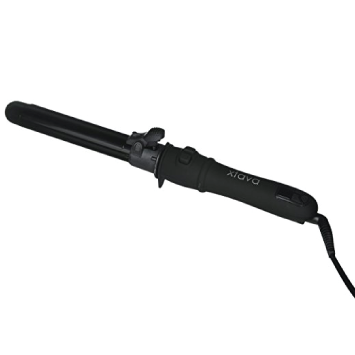 A chamber style curling iron can be trickier to use than a rotating barrel. You can only curl small sections at a time. The Beachwaver Co. S1 Curling Iron is deceptive — but in a good way. When you first look at it, you might not even realize that it’s an automatic curling iron. But the barrel of the Beachwaver rotates, making short work of getting those beachy waves everyone’s after. The tool heats up to 410 degrees Fahrenheit in just a few seconds and has a high/low heat setting switch. Unlike the other automatic curling irons on our list, the Beachwaver lets you adjust the speed of the rotation, so you can speed up or slow down the process as needed. The Beachwaver also has a smaller clamp compared to other curling irons. You’re still able to clip your hair in place while you style it, but the smaller size is less likely to create kinks or creases in your hair. 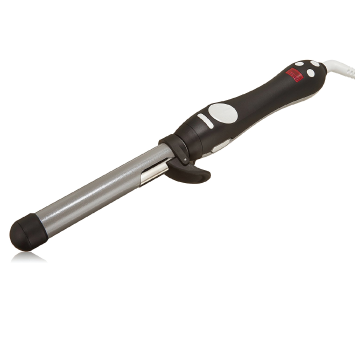 Users of the Beachwaver have called it the holy grail of curling irons. A few have pointed out that the curling iron creates waves and curls that last. Heats up super-fast, a maximum temperature of 410 degrees. Has a clamp for holding hair in place while you style it. Is on the pricier side (over $100). Curls from the bottom of the hair so that it can take some getting used to. The Salon Tech Spinstyle Pro is one of the more expensive models on our list, but it offers some extra benefits that could help most hair textures and styles hold a long-lasting curl. First, there’s the diamond ceramic barrel. The coating allows negative ions to release into your hair, which can prevent flyaways, frizz, breakage, and other damage from heat styling. Second, you’ll benefit from several temperature settings that you can switch with the turn of the dial on the hand-held part. The temperatures range from 250 to 450-degrees to accommodate a wide range of hair types and textures. We also like the spinning and grabbing design that’s free from materials or edges that may snag your hair while it curls, giving you a polished final look. You can opt for barrels in three different size – ¾-inch, 1-inch, and 1 ¼-inch – to create the style you want with multiple hair lengths. Some customers say that they can achieve long-lasting curls – even ones that last a couple of days – with this curler. The Ouiast Automatic Hair Curler has three temperature settings ranging from 350 to 450-degrees, making it a good option for hair that’s usually tough to curl or doesn’t hold curls very long. The barrel heats up quickly so that you can begin styling within a few seconds. This curling iron has a bit of a learning curve to figure out how to get your hair to spin around the barrel, but once you find the position that works best for your hair type, you’ll likely see that the curling iron does a good job wrapping hair without tangling or pulling it. The Ouiast tends to do better with medium to long hair, as it may not grasp shorter hair easily with the long barrel. Most customers agree that their hair gets the natural-looking curls they want from this iron without a lot of fuss or time. At this point, you might be wondering, how does the best curling iron – automatic stack up against your standard, run of the mill curling iron? If you’ve ever used a regular curling iron or curling wand, you might be aware of the fact that the tool can be tricky to use. Curling irons that have clips or clamps make it super easy for your hair to get caught or tangled. Clipless wands can be difficult to maneuver. Since the best automatic curling iron handles the curling process for you, you don’t have to worry about your hair getting tied in knots. An automatic curling iron will also hold your hair in position as the barrel rotates, so there’s no risk of the hair sliding out. Another big difference between an automatic curling iron and a standard, manual device is that an automatic curling iron takes the guesswork out of how long to leave the hair in the curling iron. With a regular curling iron, you’ve got to count and keep track of the time on your own. An automatic curling iron will wrap the hair, hold it for a specified time, then release it. Although there are some differences between the two styling tools, there are also some similarities between the two. You’ll want to pay attention to the same features in an automatic curling iron as you would in a standard hair styling tool. For example, the material used in the barrel and to coat the barrel is important. Just as with a standard curling iron, you want to choose an automatic curling iron that is coated with tourmaline ceramic. Another thing to pay attention to are the heat settings offered by the curling iron. Some models offer a high and a low heat setting and not much else. Others will let you adjust the heat to a certain temperature. While there is a range of temperatures, most will heat up to somewhere between 200 and 400 degrees Fahrenheit, just like a standard curling iron. 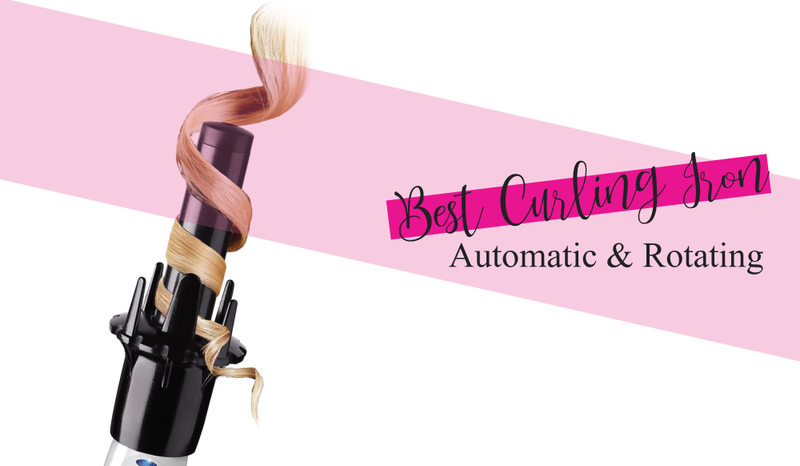 Why choose the best automatic curling iron instead of a regular old one? Well, the biggest benefit of an automatic curling iron is that it makes short work of styling your hair. Instead of struggling for hours trying to get your hair to cooperate, when you use an automatic curling iron, the tool does the hard work for you. The rotating barrel quickly shapes your hair into curls. Another benefit of using an automatic hair curling iron is that you’re less likely to burn yourself during the process. Since you have to manipulate your hair around a traditional curling iron yourself, there’s always the chance that you’ll burn your fingertips. That’s not the case with an automatic tool. So, how do you use the best automatic curling iron? Instructions will vary slightly from device to device, but it’s a good idea always to follow these pointers. Curl your hair when it’s dry. Most curling irons, including automatic ones, won’t work well on wet or damp hair. Some automatic curling irons use steam to set the curl, so you want to make sure your hair is dry first. Use a heat protectant. You don’t want to damage your locks, so spray your hair down with a heat protecting product before you start. Curl small sections of hair at a time. Start with a 1-inch section of hair, so that you don’t jam the barrel. Choose the right curl direction. Usually, you want to alternate the direction of your curls, so that you get a natural look. Most automatic curling irons have a button for changing the direction the barrel rotates in. Best Rotating Curling Iron: What Features are Beneficial? Like most heat styling products, rotating curling irons come in a variety of shapes, sizes, and designs. The best rotating curling iron for your friend may not be the best one for you if you have a different hair type. You’ll notice that rotating curling irons, like regular curling irons, come in several barrel sizes. Large barrels can create loose, bouncy waves, while smaller barrels can generate tighter, ringlet-like curls. Large barrels don’t tend to work well with short hairstyles because you won’t be able to get enough of your hair around the width of the barrel to curl it. Narrow barrels don’t always meet the needs of women with thick, very long hair, because you may not have enough barrel surface area to curl the full length of your hair. Consider your hair length and the type of curls you’re after before settling on a rotating curler. A lightweight, non-bulky styling tool can make it convenient to style your hair without worrying about a heavy tool weighing down your arm. Rotating curling irons, especially, become even more comfortable to use when they are lightweight and designed to hold comfortably with one hand. One helpful feature you might want to also look for is a swivel power cord. This type of cable will rotate as you move the curling iron from side to side to reach all your hair. It’s also a useful safety feature to have in place that can reduce your chances of tripping or getting tangled up in the cord as you curl. 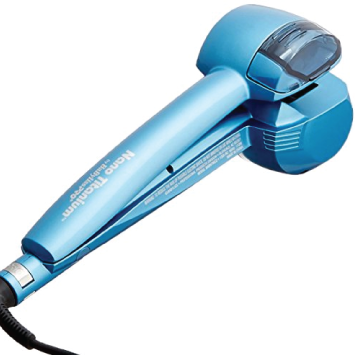 Adjustable heat is a necessity for any hair styling tool because it lets you choose the lowest temperature possible to style your hair to prevent excessive heat damage. For women who style daily or several times a week, this feature can protect the life and natural shine in your hair. A great feature to have is a wide range of temperatures with a minimum heat of 200-degrees or below and maximum heat of about 450-degrees. The more heat settings in between, the easier it will be for you to match your tool with your hair’s needs. The design and material of your rotating curling iron are two of the most crucial features to look for. Some spinning automatic irons are notorious for snagging your hair, and these typically don’t have designs and materials to prevent snags. 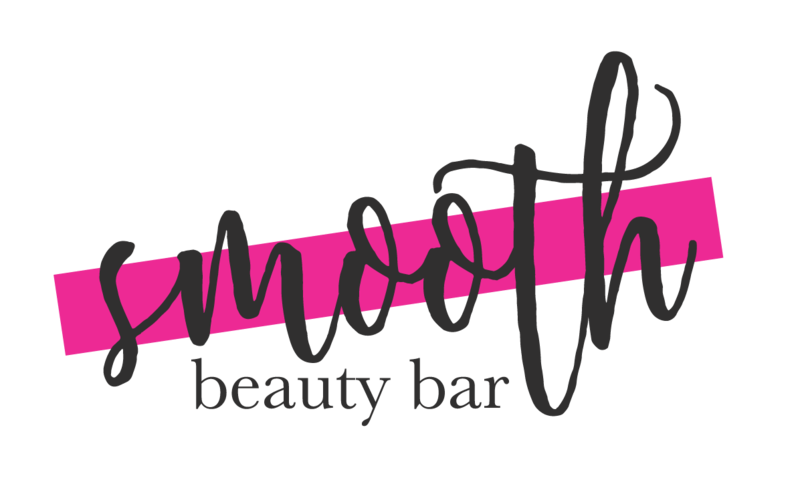 Look for barrels made from ceramic or tourmaline, or a combination of the two, which provide smoothing technology to help your hair glide around the barrel without breaking or getting caught. The rotating design should also be free of sharp edges and gaps that can pull hair as the tool curls. We have a tie. We couldn’t just pick one so we chose the BaBylissPro and the xtava as the best rotating curling irons. The BaBylissPRO Nano Titanium Miracurl Steamtech Professional Curl Machine may be one of the pricier models, but the addition of steam to set your curls moves it to a higher level. The chamber design might take some getting used to, but once you do, you’ll end up with longer-lasting, stronger curls. We chose the xtava Auto Styler as the other best automatic curling iron because of its ease of use and simple, polished styling ability. Although it’s not as hands-free as some other rotating models, we believe that this one can meet the needs of most hair lengths, textures, and styles with its rotating ceramic tourmaline barrel. We also love that it has 11 heat settings to give you ultimate control over the heat you place on your hair, which is especially helpful for women who frequently style with heated products. You can even see the temperature on the LCD display, so there’s no guessing necessary. We hope that you find the best automatic curling iron that spins for your hair needs with the help of this thorough guide and our reviews of our top picks.